Approved multi-phased overhaul of the 15-acre, 331-unit Orient Heights public housing development, which opened in 1951. All existing buildings will be demolished and replaced with new townhouse and mid-rise buildings ranging from two to five stories. New buildings will contain a total of 331 public housing units. Residences will include a range of units from one up to five bedrooms. New public green space including parks, a play area, and a plaza will be located at the center of the Orient Heights development site. The new development will also include an 8,000 square foot community center and management office. A total of 265 vehicle parking spaces and 331 bicycle parking spaces will be constructed on site. Demo of four existing buildings within the Orient Heights Development is wrapping up to make way for two new townhomes and one midrise building. The new buildings will include a total of 88 state public housing units. This is the second phase of the master plan to redevelop the 331 units of affordable housing located at the existing Orient Heights development in East Boston. Citizens Bank announced today that its Community Development Group has provided $26 million in construction financing to Trinity Orient Heights Phase Two LP for the demolition of four existing buildings and replacement of 88 state public housing units, through the new construction of two townhomes and one midrise building. This effort, led by the Boston Housing Authority, East Boston CDC and Trinity Financial, is the second phase of a master plan to redevelop the 331 units of affordable housing located at the existing Orient Heights development in East Boston. Nine of the units in phase two will be leased to tenants at or below 30 percent Area Median Income (AMI) and the remaining 79 units will be reserved for tenants at or below 60 percent AMI. All of the units will receive either state or federal housing subsidies. Building permits have been issued for Phase Two of the Orient Heights Redevelopment in East Boston. The two new permits are for an 8 unit townhouse and 4-story, 72 unit building along Vallar Street. In total, the project will be a complete overhaul of the l of the 15-acre, 331-unit public housing development, which originally opened in 1951. Phase One of the project was completed this past summer. A Certificate of Occupancy has been issued at the Orient Heights Redevelopment in East Boston with phase one complete. Phase One, was budgeted at approximately $52 million and replaced four existing buildings containing 90 apartments with 120 affordable housing units across a series of townhouses and one mid-rise building. The four-phased Orient Heights Redevelopment will replace 331 public housing units built in 1951 with 415 housing units, including 373 affordable and 42 market-rate. Phase One of the Orient Heights Redevelopment was completed in Spring 2018. 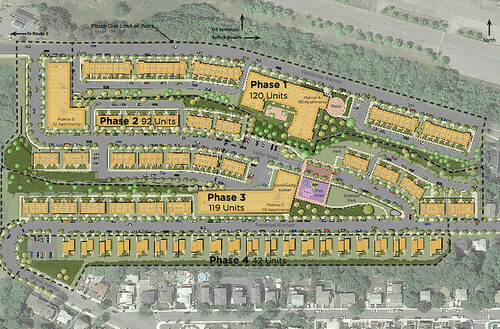 Phase Two of the revised project consists of the demolition of four structures on the northwestern edge of the project site and the construction of 88 residential units with a combination of the townhouse and mid-rise buildings, community space in the mid-rise building, 76 vehicle parking spaces, and open space and public realm improvements. A decrease of four residential units to be constructed as part of the Phase Two project, bringing the total from 92 to 88 units. The elimination of two parking spaces, bringing the total from 78 to 76 parking spaces. The elimination of 42 non-public residential units from the project, bringing the total number of residential units from 373 (a combination of public and non-public residential units) to 331 units (all public housing units). The elimination of 49 parking spaces from the project, bringing the total number from 306 to 265 on-street and off-street parking spaces. The elimination of approximately 57 bicycle parking spaces from the project, bringing the total number from 388 to 331 bicycle parking spaces. An increase of approximately 73,290 square feet of open space from the project, bringing the total from 87,985 square feet to 161,275 square feet of open space. The elimination of a roadway connection from Waldemar Avenue to Vallar Road. The existing community center within the project site will be renovated instead of newly constructed, 1,000 square feet of community gathering space will be provided in Phase Two and 5,200 square feet of community gathering space will be provided in Phase Three. 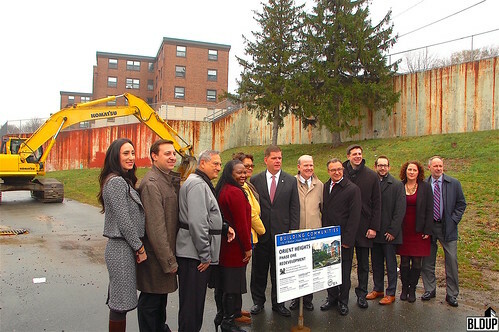 A groundbreaking ceremony was held last Wednesday (December 7th) for the first phase of the redevelopment of the aging 15-acre Orient Heights public housing development in East Boston. Phase One, budgeted at approximately $52 million and expected to open in early 2018, will replace four existing buildings containing 90 apartments with 120 affordable housing units across a series of townhouses and one mid-rise building. Upon completion, the four-phased Orient Heights Redevelopment will replace 331 public housing units built in 1951 with 415 housing units, including 373 affordable and 42 market-rate. At last night's board meeting, the Boston Redevelopment Authority (BRA) approved the overhaul of the existing Orient Heights public housing development, located in East Boston steps to the Suffolk Downs MBTA Blue Line station, for construction. A total of 51 new buildings ranging from two to five stories will be constructed including 373 public housing units, 42 market rate housing units and an 8,000 square foot community center and management office. All existing buildings on site will be demolished. Construction will last approximately eight years and is expected to commence this fall. More information about the Orient Heights Redevelopment Project is posted below. A project notification form has been filed with the Boston Redevelopment Authority for the proposed overhaul of the Orient Heights public housing development in East Boston. The proposed project would demolish all buildings on site and construct 51 new buildings ranging from two to five stories. Buildings would contain 373 public housing units and 42 market rate housing units. An 8,000 square foot community center and management office would also be built on site. The project would be developed by Trinity Financial in collaboration with the East Boston Community Development Corporation and the Boston Housing Authority. The project would be constructed in four phases. The development team expects to commence construction of the first phase this fall. Expected completion of the final phase is in 2024. The following is a link to the full Project Notification Form. More information about the proposed project is posted below. Developer Trinity Financial has filed a Letter of Intent with the Boston Redevelopment Authority to redevelop the Orient Heights public housing development in East Boston. Construction would begin in fall 2016 pending Boston Redevelopment Authority approval. The following is a link to the Letter of Intent. BOSTON– December 7, 2016 – The Boston Housing Authority, East Boston Community Development Corporation and Trinity Financial, a community-driven, diverse real estate development firm with a proven-track record of redeveloping complex urban sites from New York to Greater Boston, today broke ground on Phase One of the development of Orient Heights in East Boston, MA. Phase One will result in the demolition of four existing buildings containing 90 dwelling units and the central boiler plant and the new construction of 120 affordable housing units in a series of clustered townhouses and a mid rise building along Waldemar Avenue, the northern section of the 15-acre Orient Heights site. The project is the first phase of a comprehensive, multiple phase master-planned redevelopment for the entire Orient Heights development. As it stands, Orient Heights is comprised of 331 units of state-funded public housing terraced into a steep hillside built in 1951 and in great need of maintenance and modernization. Upon completion, the collective phasing effort will yield 373 units of housing, 331 of which will be replacement units. 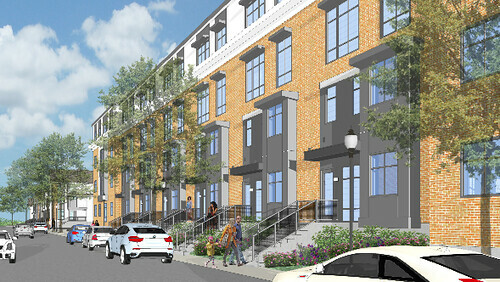 The Department of Housing and Community Development (DHCD), Boston Housing Authority (BHA), East Boston Community Development Corporation (EBCDC) development team, ICON Architecture (ICON) and Trinity Financial are working together to transform the site into a modern community made up of contemporary, code-compliant, and energy-efficient units modeled on the successful transformations of the BHA’s Federal HOPE VI site. Phase One of Orient Heights seeks to create a mix of energy-efficient, code-compliant units to meet the current needs of the BHA and DHCD and allow for adequate open space and parking for the community. This development intends to foster a community that is integrated with surrounding neighbors and will be constructed to encourage potential additional non-public housing units in later stages of redevelopment. “We are looking forward to working with our development partners Trinity Financial to revitalize the community as we successfully did together at the Maverick development in Eastie several years ago,” stated Bill McGonagle, BHA Administrator. Phase One of the development is budgeted at approximately $52 million with an expected completion date of early 2018. Funding for Orient Heights was awarded through a variety of sources, including: a $26.5 million construction loan from Citi; $18 million in equity from Raymond James; $32.725 million in HILAPP and State Capital Funds; and $1 million in Neighborhood Housing Trust Funds from from the City of Boston Department of Neighborhood Development. Since 1987, Trinity Financial has pursued a distinctive vision in real estate development, dedicated to revitalizing neighborhoods, strengthening commerce and fostering opportunities through a collaborative urban spirit. Our work spans half a dozen residential and commercial specialties, from multi-unit housing to transit-oriented development. Across that spectrum, Trinity projects demonstrate a high caliber of vision and attention to detail, which sets them apart and has led to sustainable success.